Oasis: the other two are there to hold the coats. Noel and Liam Gallagher have had some famous dust-ups over the years, so it seems entirely fitting that, this weekend, they're finally going to step into a boxing ring together. However, the quarrelsome brothers won't actually be fighting themselves - they'll be carrying British boxer Ricky Hatton's IBO world light-welterweight title belt at the MGM Grand in Las Vegas. Hatton is set to defend his title against American Paulie Malignaggi, and is reported to have said: "It's a real honour for me. 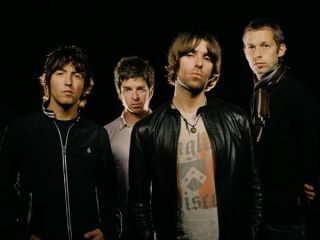 I've always been big fans of [Noel and Liam's] and I have to keep pinching myself because, as I have got to know them, I have discovered they are big fans of mine." We don't know what the Oasis boys will be wearing as they lead Hatton into the ring, but we can only hope that they'll eschew the bikinis that are typically worn by the girls who hold up the round cards. Hatton has also revealed that he's been playing the Gallagher brothers' music in training, listening to them in preference to The Godfather Of Soul. "I walked into the gym and James Brown was being played on the stereo," he reveals. "I had it taken off and had some Oasis put on." MusicRadar has always had a preference for the Rocky IV Training Montage music during a workout, but each to their own.